Valencia CF: Pablo Piatti on his way out? Pablo Piatti on his way out? There are various reports in Spanish media that supposedly Pablo Piatti is on his way out of the club and the club is looking to add another player who can play on the left wing. The club has already officially singed Santi Mina who can play at both wings and reports are suggesting that Zakaria Bakkali a Belgian footballer who currently plays for PSV at right and left wing is very close to signing with Valencia CF. He has played predominantly as right wing, and considering that Santi Mina also plays predominantly at right wing and as a forward doesn't make much sense, but perhaps Valencia CF coach Nuno thinks that he can convert him left wing or maybe even play Jose Luis Gaya as left wing and start with Lucas Ornan as left back, though that would mean we need to get another left back in case Lucas Orban is injured. 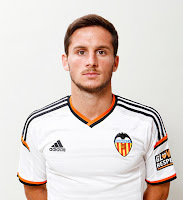 Anyways a lot of speculation going on right now, hopefully Pablo Piatti continues with Valencia CF though as he was one of the key players for the team last season and could build on a successful season. Also he is 26 years old and players peek around 25 to 27 years old, where they play the best football.